If you are looking for information on the Snappy Tomato Pizza franchise business opportunity, Snappy Tomato franchises or Snappy Tomato Pizzeria franchising, then you have come to the right place. 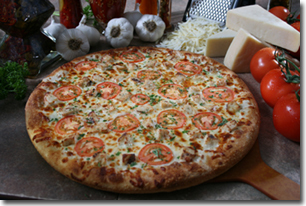 Why Choose Snappy Tomato Pizza? Snappy Tomato Pizza specializes in providing top-quality pizzas, hoagies, salads, and Snappetizers with efficient and friendly service. We differentiate ourselves from our competitors with our fresh dough made daily, our 24 slice BEAST Pizza, "Snappy" our lovable mascot, and our signature Snappy Sauce. As you know, choosing a company that separates themselves from the competition is imperative to the success of your business. Joining our franchise will give you that edge and provide you with the training and marketing support to confidently grow your business. The full sit-down restaurant with a buffet that also operates a complementary del/co service. The convenience store (C-store) unit that operates in smaller areas and specializes in del/co service at lower costs of start up. As a new franchise owner you will be trained in an existing unit on everything from operations to local marketing. After you're thoroughly trained, we will send a corporate representative to your store to assist in training your staff and engaging them in several trial runs to assure that your business is running smoothly from the day you open. Even after you have finished your initial training process, a corporate representative will continue to monitor the operation on a regular basis and assist in the development of your franchise. A dynamic relationship must exist between franchisor and franchisee to effectively promote the growth of our company. The success of the franchisor and the franchisee is dependent on the success of each other. Everyone must be working toward the same goals. Communication and trust are instrumental for maintaining dynamic relationships and a focused vision.